WE ARE SORRY FOR ANY INCONVENIENCE, BUT THIS EVENT IS CANCELED. WE HOPE TO RESCHEDULE! PLEASE EMAIL INFO@NATUREYOGA.COM IF YOU ARE INTERESTED IN ATTENDING AT A LATER DATE. 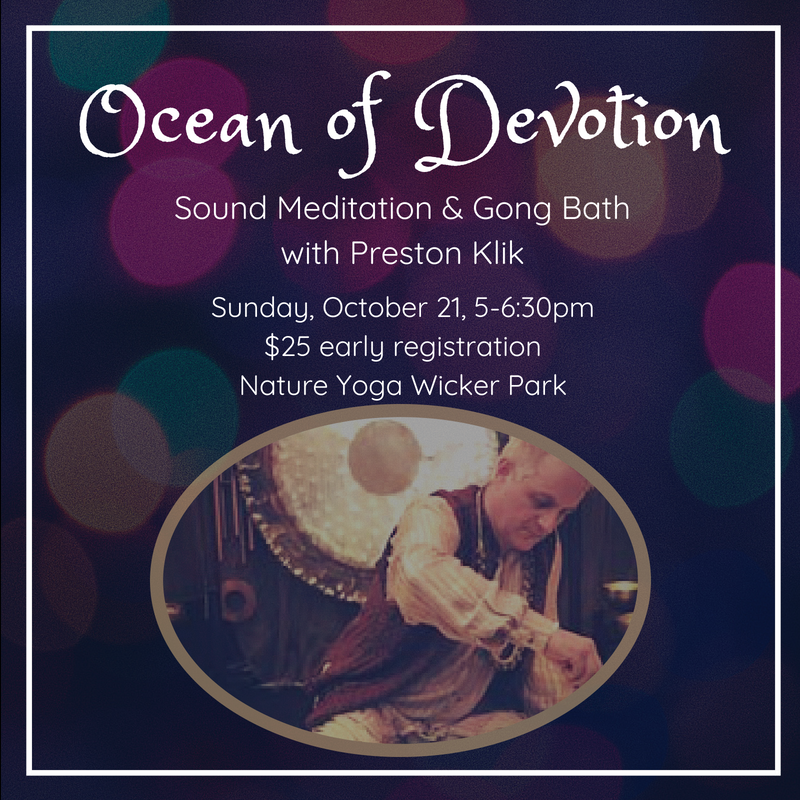 "If prayer had a sound, this might be it"
Preston Klik's Ocean Of Devotion GONG & BOWL SOUND MEDITATION is a gentle-but-dynamic, 90-minute acoustic journey, often very quiet, but at times powerfully intense. Preston plays a 36-inch HEART GONG, plus crystal bowls, Tibetan bowls, ocean & water & thunder drums, 2 smaller gongs, chimes, etc. His "portable temple" is surrounded by candles. This richly cinematic musical odyssey-meditation is as beautiful to the eye as it is to the ear, heart, body, mind, and spirit. Preston Klik combines his love of sound with his passion for spirituality in his true Calling: Sound Healing-Meditation. As a Gong-Whisperer, he creates sacred space so others enter a Portal of Higher Consciousness. He lives with his wife Emily in their Temple Synphorium, Evanston IL. Preston's a follower of many teachers and paths: Amma, Christ, Ken Wilber, Buddha, Andrew Cohen, Adi Da, Adyashanti, Dalai Lama, Eckhart Tolle, Gandhi, Landmark Forum, Mother Teresa, Rumi, TM.